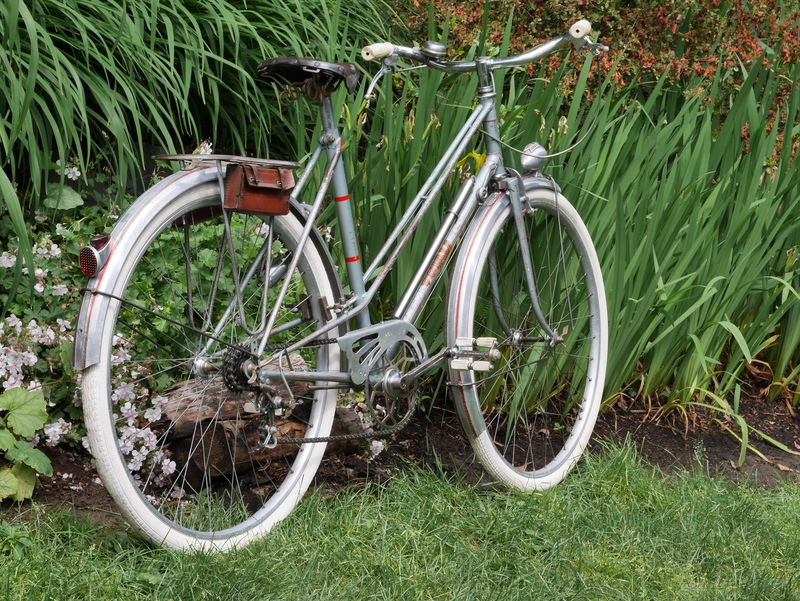 Here is a very pretty 1953 Follis Mixte featuring Nervex lugs, Fratelli Brivio hubs, Mavic 650b rims, a Simplex Juy rear derailleur with 4 speed freewheel, and a number of other nice features. 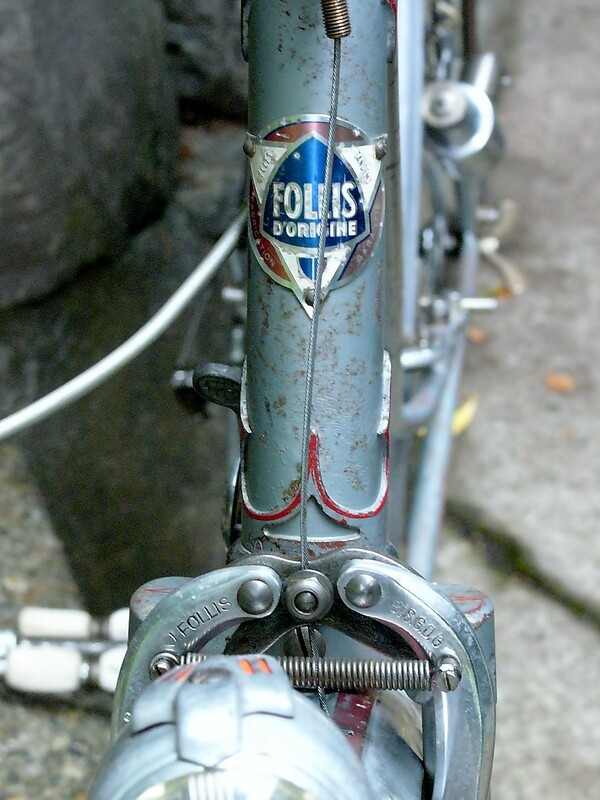 Follis was another highly regarded French builder, founded by Joseph Follis in Italy in the early 1900’s. In the 1920’s, the company established its headquarters in Lyon after Mussolini took power. 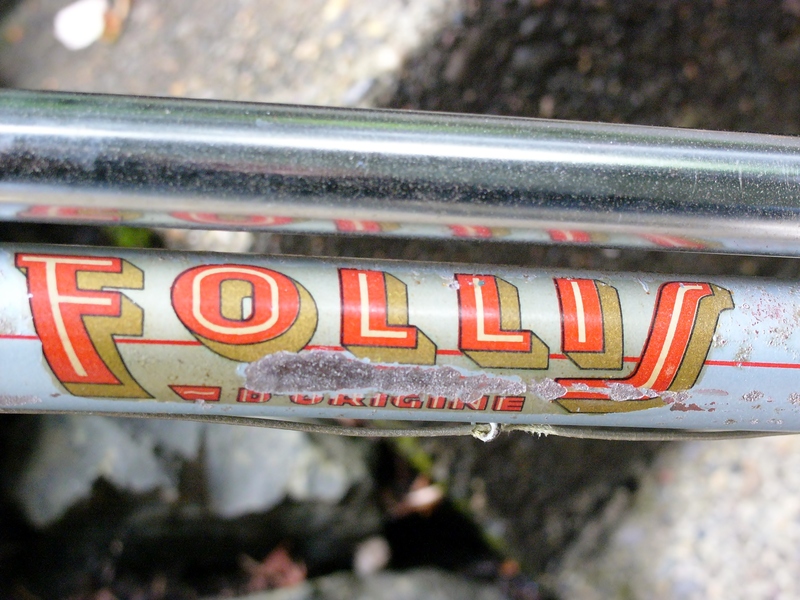 During and after WWII, the Follis company expanded and began building all kinds of bicycles, varying in purpose and price range, many of which were re-branded by other marques. This Follis was owned by Nicole Montbarbon, who resided in Bourg, Ain, France. 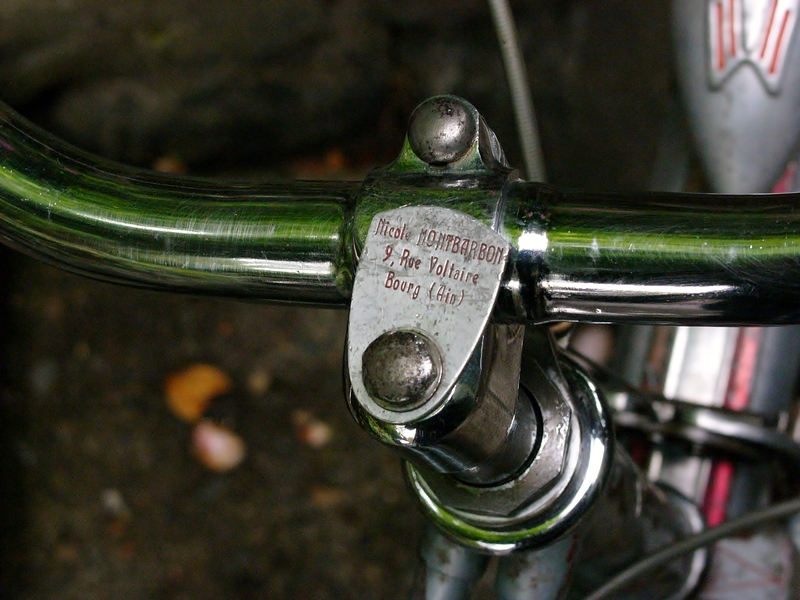 A clearly visible owner’s name tag was a requirement for all French bicycles during this era. Nicole took good care of her machine. 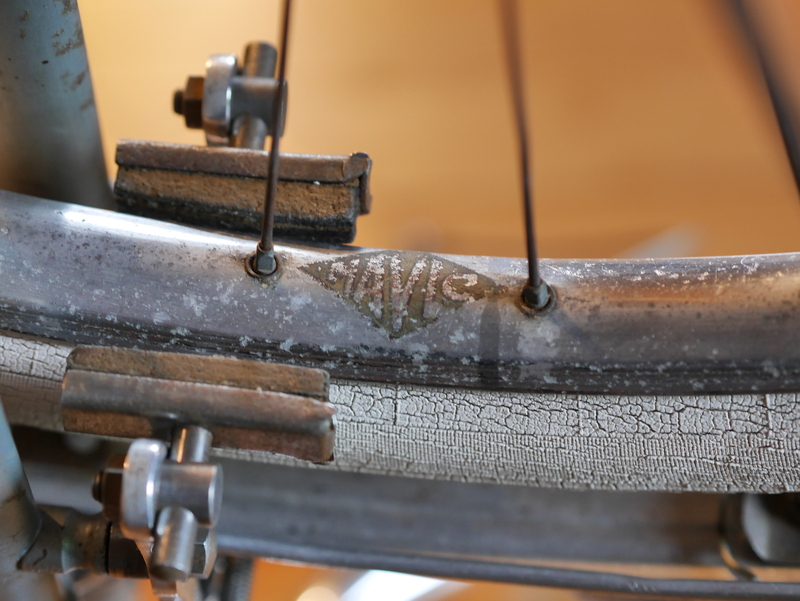 Even though the finish is very scratched, the bike appears completely intact and all original, possibly even down to the Michelin 650b 44 mm tires, color matched to the white Sufficit grips and rubber block pedals. 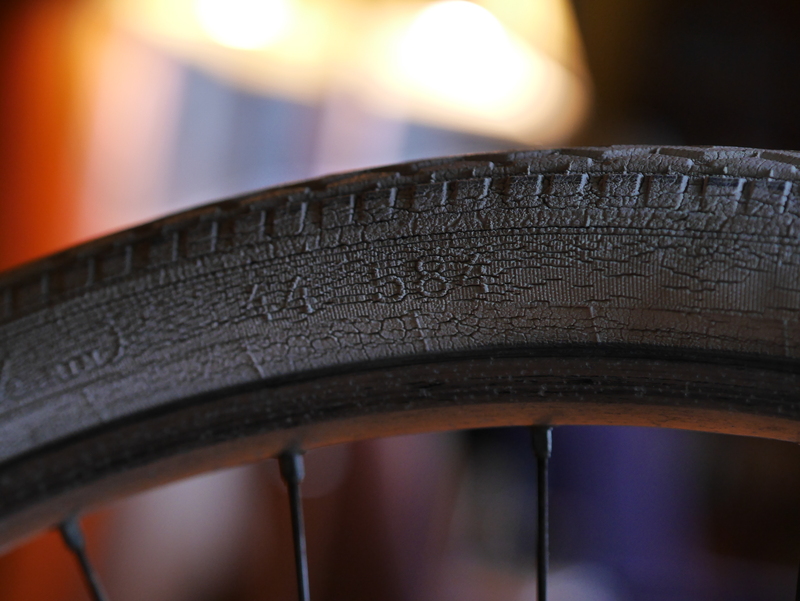 Michelin 650B 44 mm tires – heavily cracked sidewalls means they are not safe to ride and should be replaced. Follis branded Jeay style brakes, nickel plated. These Follis Jeay-style brakes are a bit nicer design than others I have seen. The inner plate, which pulls up on the caliper arms when the brakes are engaged, has a groove for each arm to travel on, so they stay in adjustment a bit better. F.B. 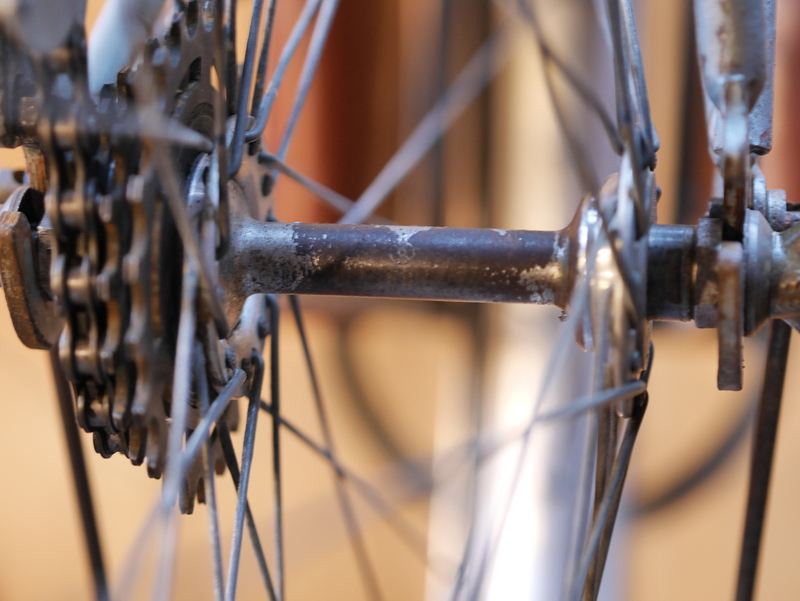 – Fratelli Brivio hubs. Fratelli Brivio hubs are a nice touch, though the finish is now gone. F.B. was an Italian component maker who first built hubs for Campagnolo, among others, as well as under their own name. Nervar cranksets are not as highly sought after as Stronglight and T.A., but can be equally nice. This one’s finish is pretty bad off, and it probably wouldn’t be worth it to re-chrome it. 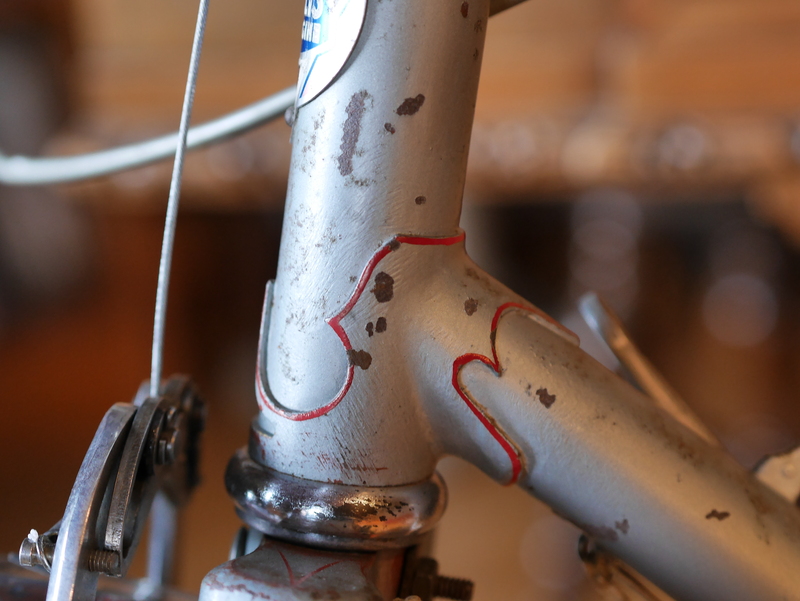 Instead, the patina adds to its vintage appeal. Minimal brazing for the top tube/seat tube attachment. Through the frame cable routing for the rear brake. Brass barrel adjuster for the rear brake. I have been amazed at the number of different ways a mixte frame can be configured. 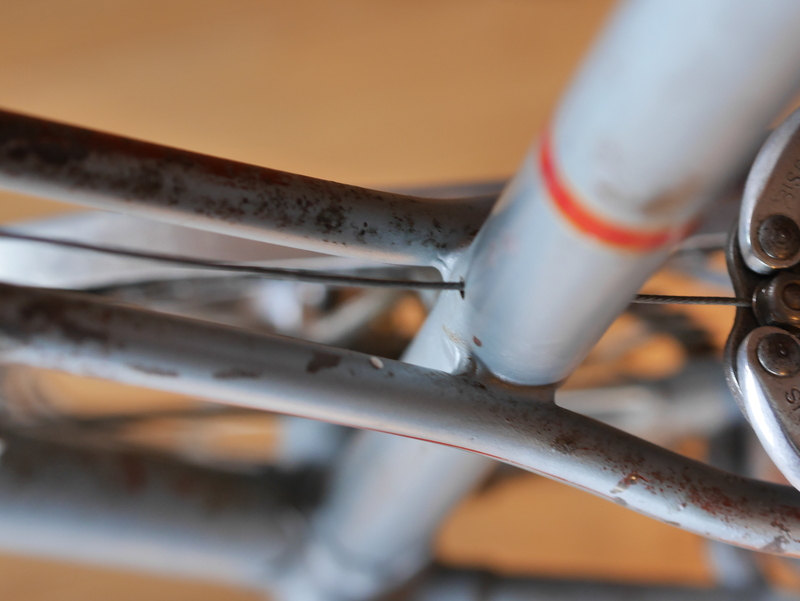 In this case, the twin sloping top tubes are hand bent at the seat tube attachment, where they are minimally brazed, before travelling back to the rear dropouts. The frame includes pump pegs, double eyelets front, single eyelets rear, and braze-ons for the shifter and dynamo. However, this particular frame was not built with the highest quality workmanship. Although the Nervex lugs are fancy, the drop outs are stamped, not forged, and the finish work on the ends is just so-so. Even so, a cursory examination of the tubes revealed absolutely no dings or dents, just a lot of scratches and lost paint. The lighting system looks intact, except for some broken wiring. The lamps and dynamo are branded SELF. The lenses and reflectors are not cracked and have a fun art-deco look to them. 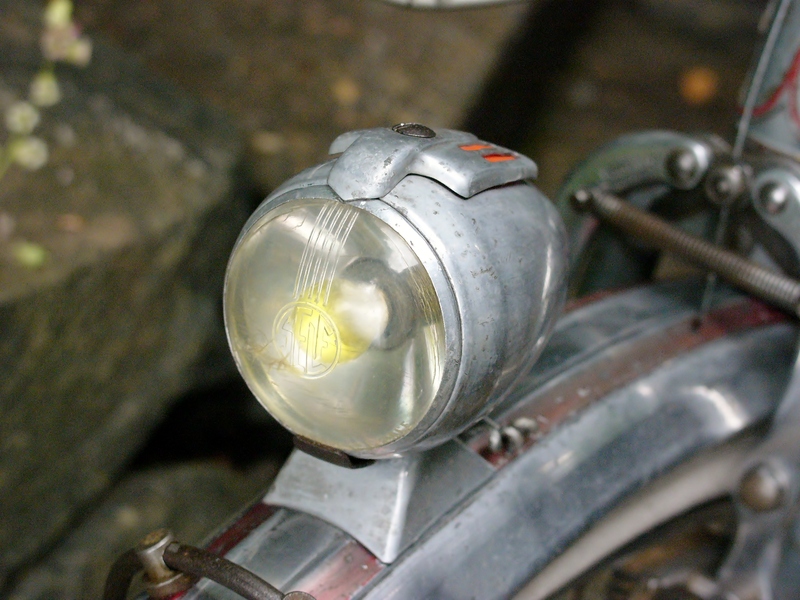 Note the yellow front bulb. Simplex shifter mounted to frame braze-on. 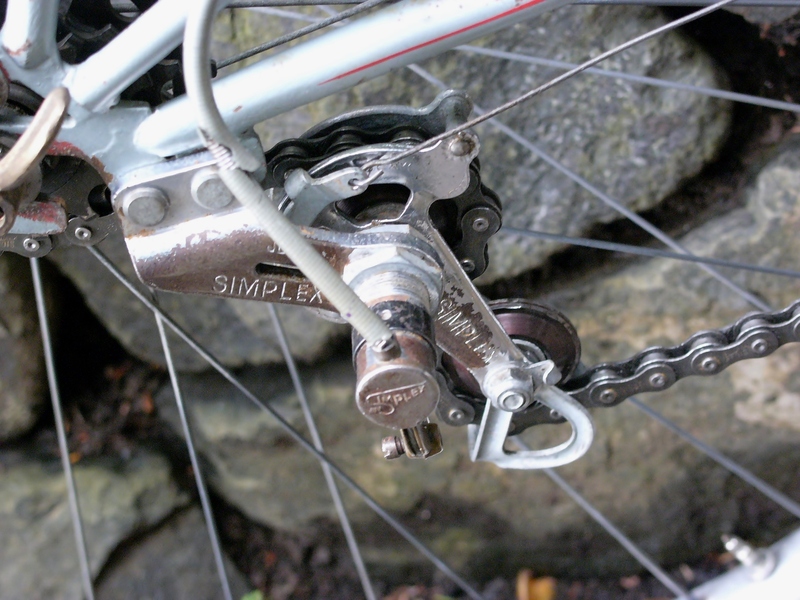 The Simplex rear derailleur is frame mounted. This model uses a “bell crank” to move the cage. I haven’t worked on this model before, but fortunately catalog scans are available from Disraeli Gears. 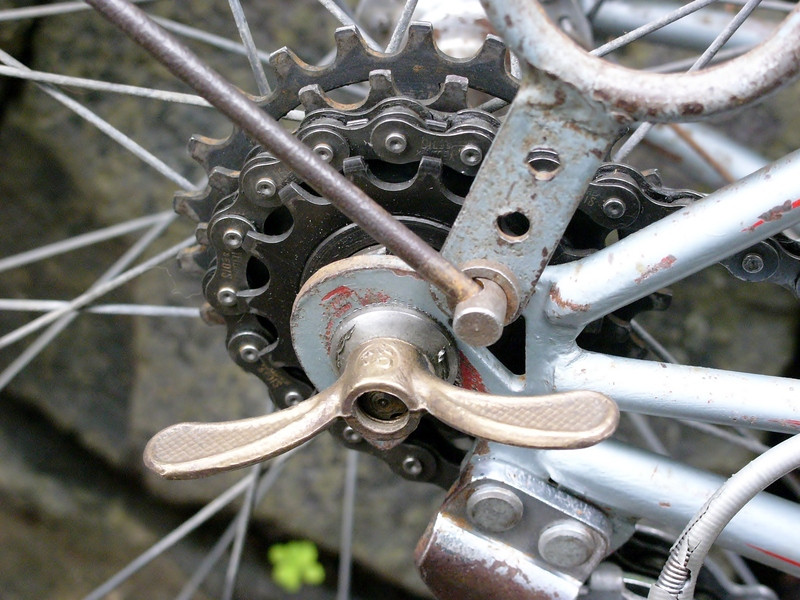 This derailleur has open pulleys at the back of the cage, allowing you to remove the chain from the derailleur without breaking it, a helpful feature. 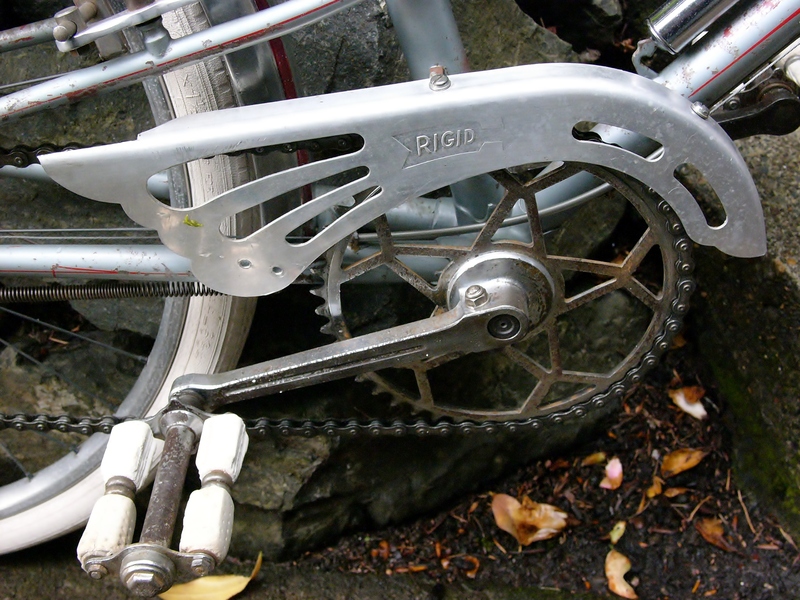 The chain is a Sedis model Yellorex, which also appears to be original to the bike. 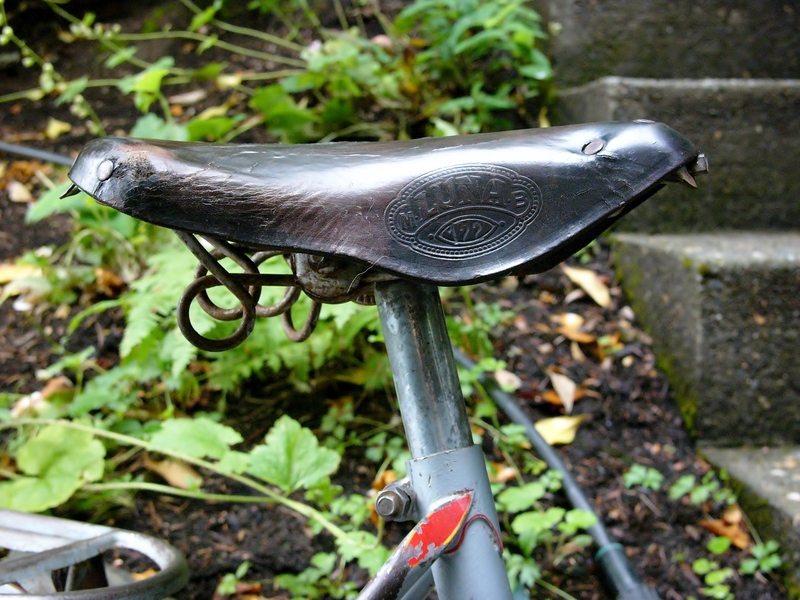 Luna Model 122B leather saddle. 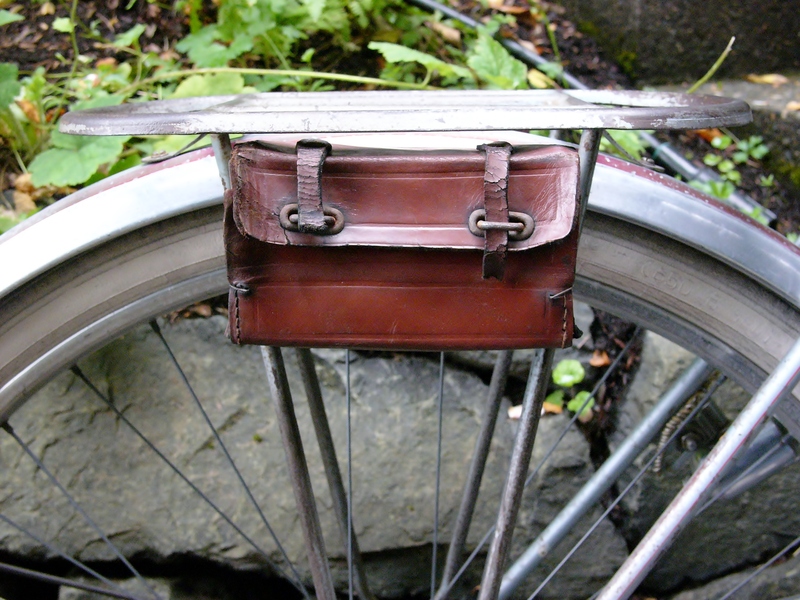 I originally acquired this bike as a “donor” – to give me some needed parts for other projects I am working on. However, given its completeness and classic beauty, I may change my mind and restore it. Perhaps that would please Nicole, wherever she may be. Nous verrons! 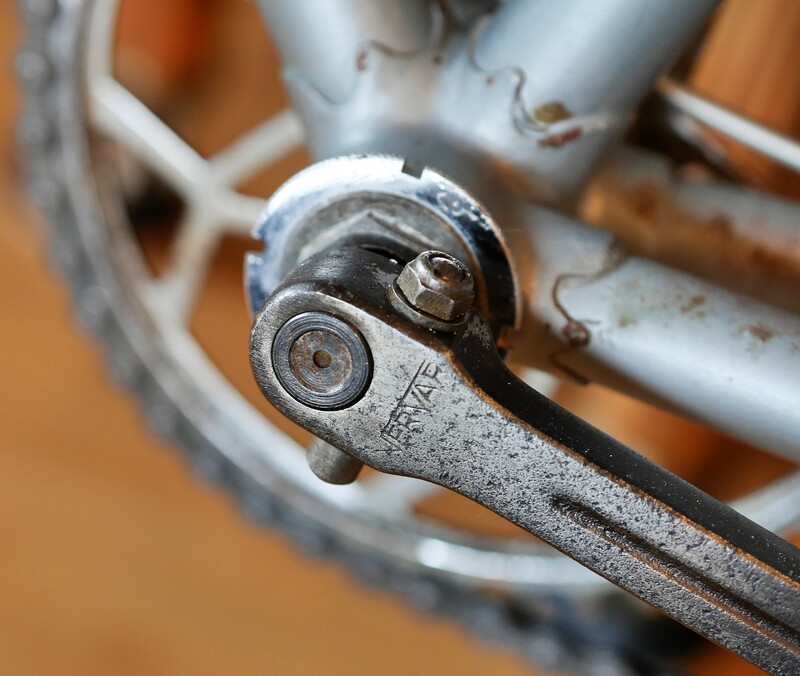 This entry was posted in 650B, Bicycle restoration, Follis, French bicycle, Mixte, Simplex derailleur, town bike, Vintage bicycle restoration, Vintage French Bicycle and tagged F.B. hubs, mavic rims, Nervar, Simplex Juy by Nola Wilken. Bookmark the permalink. What a sweet steed! On a more general note, I enjoy reading what you share about the bicycles you acquire and restore. Thank you – glad you enjoy the blog. Thanks for sharing. A nice example of a practical, comfortable and convenient mode of transport (and we know that bikes are always fun too). 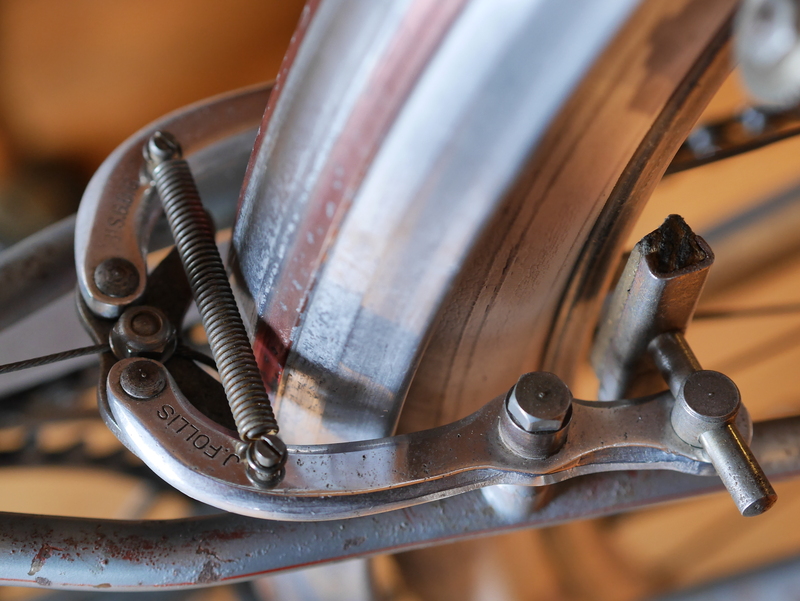 As you no doubt already know, restoration can be tricky with French specifications with different thread sizes and directions for bottom brackets, pedals, handlebars, etc. A quick internet search suggests that the ex-owner is the current Mayor of Lentilly, 20km from Lyon and the same address appears too; now Boulevard Voltaire, Bourg-en-Bresse. I wonder how her bike got to your neck of the woods. Richard, thanks. I don’t know if that is the same Nicole as the owner, but if it is, that would be quite sweet. If my French language skills ever improve, I may try to see if I can get in touch with her. 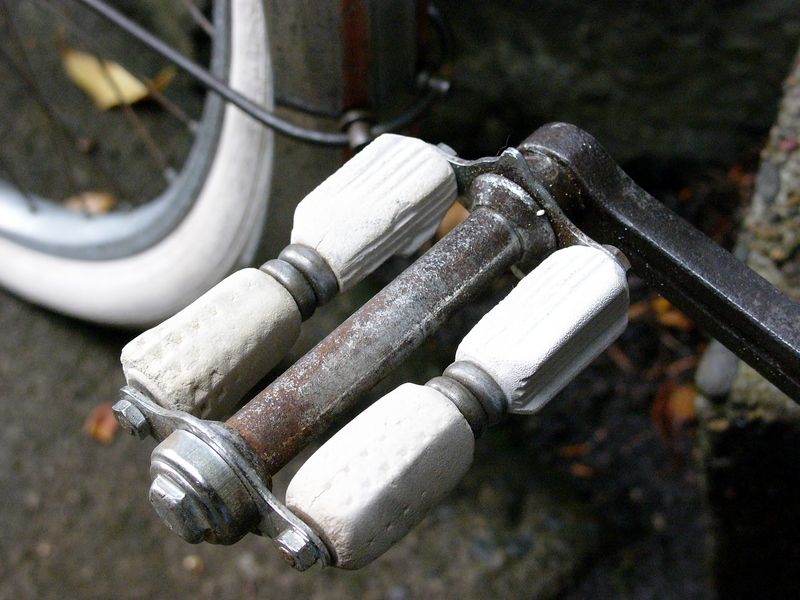 French threaded parts are to be treasured by anyone who restores bicycles – and fortunately, French eBay can come to the rescue, which is how I discovered this machine. Where oh where do you find your gems, Nola!? What a wonderful mixte. 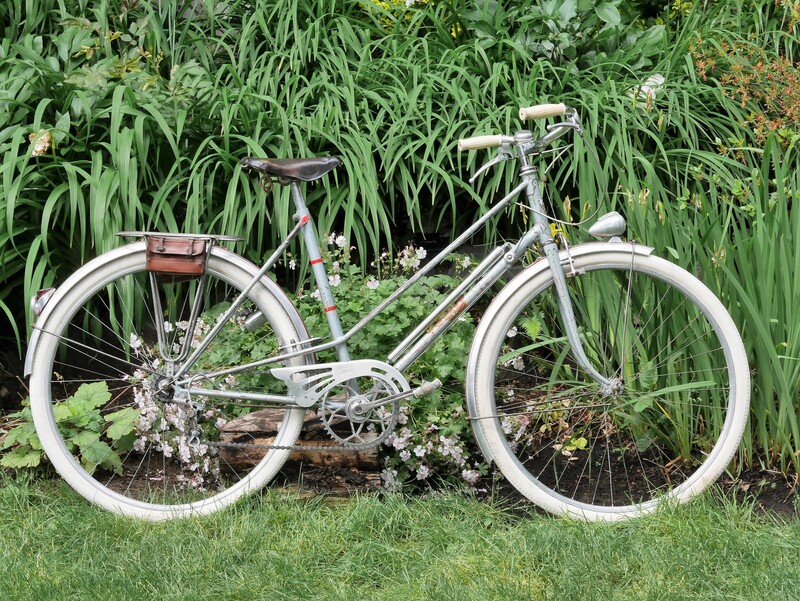 Over the years, I have come to find a deep appreciation in the design and function of the mixte frame. There is a lot going on when it comes to split top tube frames and yours is no exception. I adore the hand bent steel. It gives a very distinct look that you certainly don’t see often. 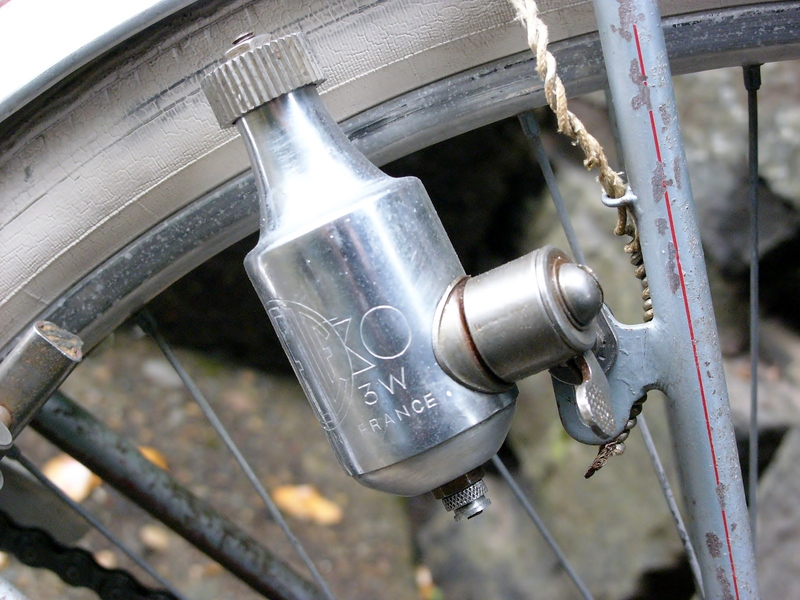 Also, the Follis Jeay-style brakes are so simple yet gorgeous in their function. Funny you mention the inner plate that pulls up to engage the caliper arms. That is the exact technique Suntour roller cam brakes work, which debuted in the 80s. Funny how ideas are recycled, isn’t it? Also, as a side note, your photography is smashing for this post. Keep up the great work! Josh – thanks for your comments. Mixte frames come in so many different configurations, and this one is quite lovely – clearly built for comfort, but nonetheless elegant. For these photos, I used both the old Leica Digilux 2 and the new Panasonic Lumix 4/3 rangefinder, using two different lenses with it – for a total of 3 lenses for these photos. While the older Leica is much more fidgety, the Summicron lens has the edge in terms of picture quality. Question nobody can seem to answer: the eyebolts on the Follis pass through the fluted part of the fender. 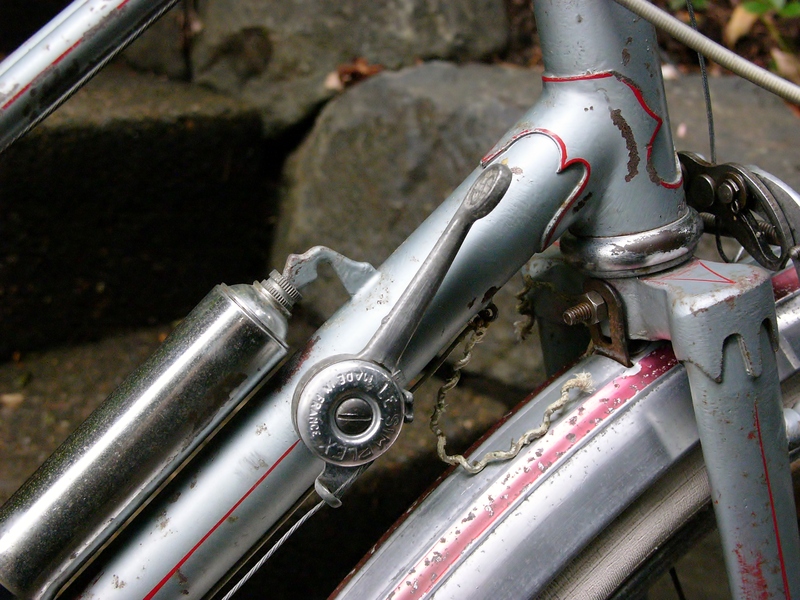 Does that flatten the soft aluminum of the fender under the eyebolt? How is it mounted? Eyebolts have flat parts that touch the fender. But the fender is not flat in that area. So is there any extra metal piece to fill the concave area (on the outside of fender), or to fill around the convex shape on the inside of the fender? Thank you in advance. Dying to know. Hi Joe, the eyebolts can flatten the soft aluminum fender. 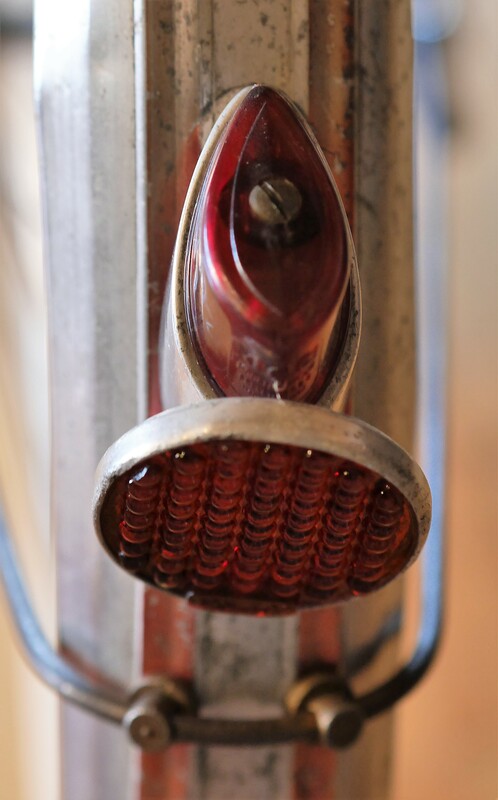 In the case of the Follis, there are two eyebolts to support the one piece stays which curve around the fender, making for a nice secure connection. You can add a leather washer if you get some rattling, but this Follis has metal washers underneath each eyebolt on the inside of the fender. 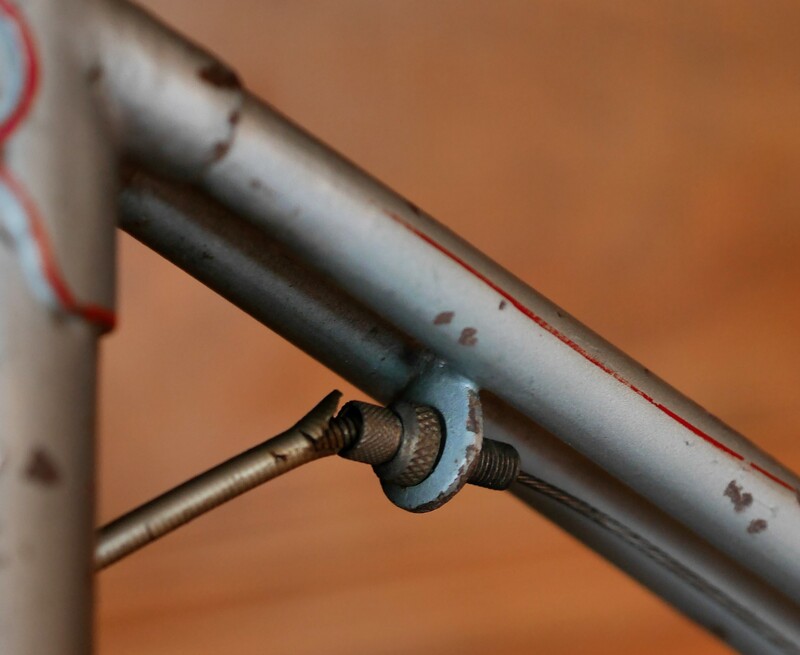 The Velo Orange website/blog offers some good insight on mounting aluminum fenders.